Is Pop as addicting as popping bubble wrap or as boring as watching paint dry? Well let's find out! 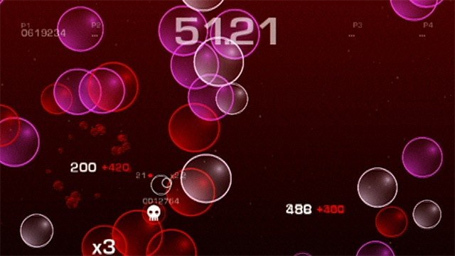 In Pop you pop bubbles to earn points and ultimately aim for a high score on the online leaderboard,however this game is quite deep as you are about to find out. First of all there are special bubbles that can have either good or bad effects such as the bio-hazard bubble that explodes and pops all same colored bubbles,or the target bubble that increases the size of your cursor! Beware of the skill bubbles as they will reduce your timer! You also have combo's that add to the depth of the gameplay,combo's are created by popping bubbles of the same color repeatedly to create chains the longer the chain the bigger the point bonus will be! Then you have bonus rounds which activate at the end of a wave if you did well enough doing well in the bonus rounds is essential to get a very high score! Pop also has up to 4 player local multiplayer which can be quite fun or stressful depending on how the people you play with play the game. Pop features very simple graphics that are pleasant to look at such as beautifully colored water and smoothly running graphics. The details in the animations are very realistic such as bubbles being forced away from the bubbles you pop which just adds to the soothing feel of this game! The music is peaceful and further adds to this great casual title though it certainly could use a few more tracks,it is great! The sound effects are also simple yet effective and include things like popping bubbles and simple arcade like sounds such as explosions when popping special bubbles. Bottom Line-If you want something that is casual yet enjoyable,that has deep gameplay,simple yet beautiful graphics,and soothing music,with a dash of competition via the leaderboard then Pop just might be the game you are looking for! Rukiafan wrote: Where's the top pic? But other than that, your review was pretty good ! This game is a great game to play if you want to relax and unwind after having a stressful day!